Ivory James got another graded stakes finalist on Friday when Groupie James qualified for the West Texas Derby at Sunland Park. SUNLAND PARK, NM�MARCH 10, 2017�IVORY JAMES' son Groupie James posed the 8th fastest qualifying time for the Grade 3 $162,600 West Texas Derby at Sunland Park Friday afternoon. Racing for owner Carlos Trujillo Jr. and trained by Wesley Giles, Groupie James is an Arizona-bred from the A Regal Choice mare Groupie. H & E Ranch, Inc. is the breeder. 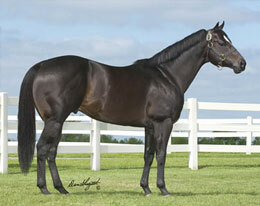 Last season Groupie James was a finalist in the Grade 2 West Texas Futurity and the Grade 3 Ruidoso Juvenile Challenge. The top ten qualifiers, from 48 three-year-olds who participated in five trial races Friday, will return to Sunland Park on Sunday, April 2nd to vie for a $76,422 winners' purse going 400 yards. For the complete list of West Texas Derby(G3) finalists, times, sires, dams, owners, breeders, trainers and jockeys CLICK HERE.